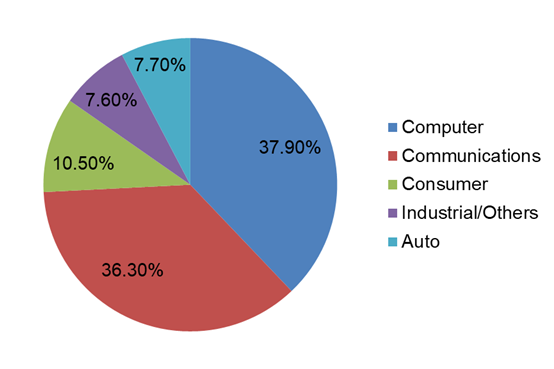 PC applications account for the biggest share in the worldwide IC market with a share of more than 30% and the consolidated share of the PC and communications application ICs reaches about 74%, according to Taipei-based research institute MIC (Market Intelligence & Consulting Institute). "Affected by the emergence of smart mobile devices and IoT devices, computer system shipment volume has declined, leading to a slide in PC application IC revenue which used to make up more than 50% of the total chip revenue," says Jane Yeh, senior industry analyst with MIC. "In 2015, share of communications application ICs surpassed that of PC application ICs. Thanks to emerging computer applications in 2016, demand for higher computing performance increased, driving up demand for PC application ICs. As a result, PC application ICs regained its lead over communications application ICs by a small margin."